Order all of your supplies including your notary public stamp, seal, recordbook, or choose a notary supply package. Supplies are grouped below by category. 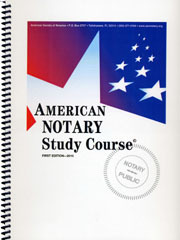 The American Society of Notaries provides the highest quality notary information, support, training, and supplies for notaries throughout the United States, since 1965. To place an order online choose from the notary supply categories below. If you are an ASN member please log in with your ASN ID number and password PRIOR to placing your order. If you are NOT a member, you must join ASN PRIOR TO obtaining access to the special members-only prices and products. 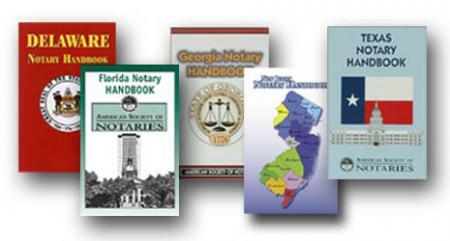 To place an order by mail or fax, please download our Notary Supply Catalog. Ordering instructions are located on page 8. For questions about products, order processing requirements, or to place an order by phone please call (850) 671-5164. Please click here to view our Refund/Return Policy. Notary Seal Extras - Seal Impression Inker and Gold Seals - Make sure your notary seal impression is photographically reproducible (required by law in most states) by using a seal impression inker. Or add a special touch to a notarized document by adhering an embossed gold foil seal. Notary Stamp and Seal Packages - Order all of your notary supplies together and save! Notary stamp and embossing seal packages; choose from the self-inking notary stamp or rubber stamp. 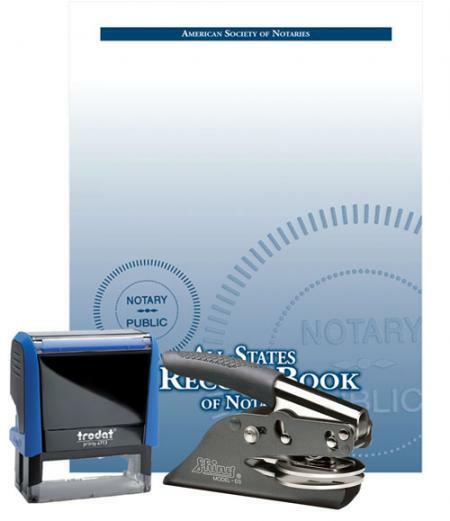 Add the All-States Notary Recordbook or journal for even more savings. Notary Stamps and Embosser Seals - ASN offers a variety of notary ink stamps and embosser seals. Choose from self-inking round and rectangular notary stamps or rubber round and rectangular notary commission stamps. 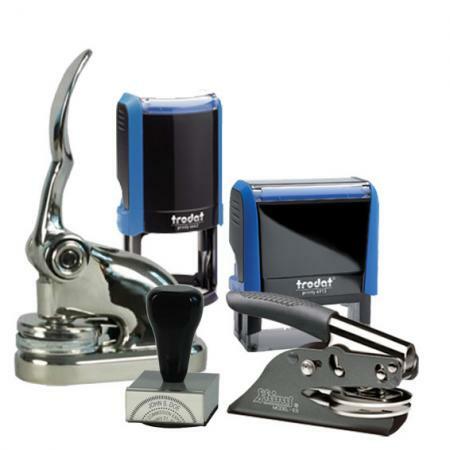 Embossers available in both hand-held seals and desk seals. Notary Extras - Extra products notaries want and need. 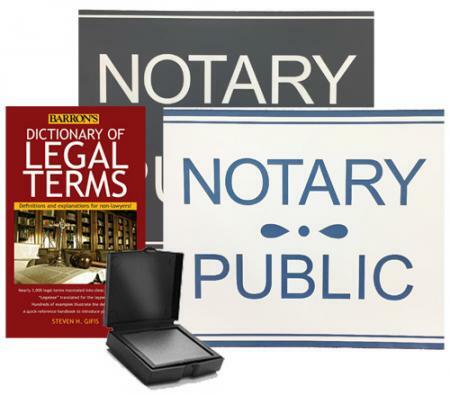 Choose from the Thumbprint pad, Dictionary of Legal Terms, Notary Public Signs and more. ASN All-States Notary Recordbook - The notary recordbook (also called a notary journal, notary log, or notary register) is the best tool a notary can use for protection against claims of impropriety or malpractice. 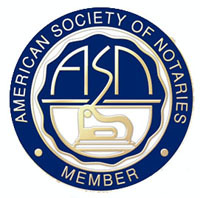 ASN Memberships - ASN is dedicated to providing its members with education, professional service and technical support; promoting high ethical standards; and increasing public awareness of notaries' valuable contributions. 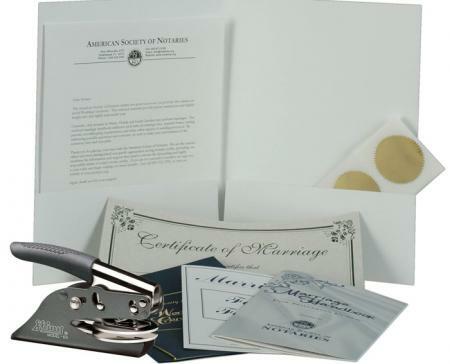 Notary Marriage Kits - ASN's Marriage kit contains the extras notaries need to perform marriage ceremonies with confidence. A notary public in FLORIDA, SOUTH CAROLINA, and MAINE is authorized to perform marriage ceremonies. Notary Handbooks - ASN's state-specific notary handbooks are your must have reference for basic notary public procedures, laws and rules, certificates and definitions. ASN offers titles for Delaware, Florida, Texas, Georgia, and New Jersey. 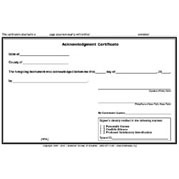 Notarial Certificates - Notarial certificates offered in pad format for basic acknowledgment, jurat and certificate for an attested/certified copy. Certificate stamps offered in the acknowledgment and jurat formats.